My mom is a funny lady. She has a green thumb, really enjoys being outside in the garden. A few years ago she moved into an apartment and started container gardening, had all sorts of beautiful flowers on her patio. Something was chomping on them, and that something was SNAILS! Now, normally snails can be treated with a little poison in a line around your flower bed. But what do you do when your flower bed is elevated away from normal snail territory? There were no tell-tale shiny slime trails leading to the hanging baskets or the planter boxes, yet somehow they were getting in and eating all the pretty flowers! After several baffling months of this, Mom looks up and sees them in the tree, dropping off branches into the flower pots. So we started a little game called Smash The Snail- using the icky garden broom (or Mom’s cane when she still used it, she’s in a wheelchair now) you smack the snail right off the tree branch. If you hit it right, it smashes on the tree- watch out for guts! If not, you knock it off the tree and smash it on the ground. Sounds gross? It is! And after watching the pests eat all the gorgeous blossoms, it’s very satisfying, in a morbid sort of way. She recently had major surgery, and spends a great deal of time in bed. She’s missed getting out in the garden, and yes even missed the Snail War (though now she can run them over with her wheelchair- mwuahahahahaha! ), so I thought I’d do something nice and make her an amigurumi snail! Mom was asleep when I finished this little guy, so I set him on the bookshelf next to her bed, where she’d be sure to see him when she woke up. Aaw, aren’t I a sweet daughter? Thursday, I’m starting to second-guess the cuteness and wondering if she didn’t like my little handiwork. FRIDAY, she looks at me with the sweetest expression and says “I love my surprise. You must’ve put it there while I was sleeping last night.” Yes folks, it took my mom 5 days to notice the snail by her bed! I just came across this. Hope your mom is feeling better! Hey Rachel, all of your projects are so cute! keep up the good work,from a fellow PBS sista! OMG, he is SOO CUTE! 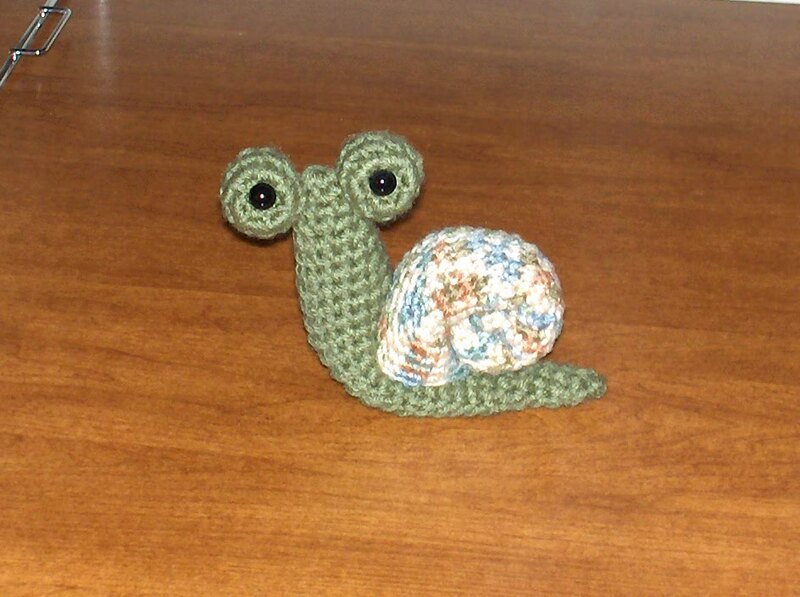 I keep looking and looking for really cute crocheted snail patterns. I’ve found a few, but I’m not just “I love it” over it until I saw Escargot. Are you going to share or sell the pattern anytime soon. I just absolutely love this snail!